Since 26 October Sri Lanka has been plunged into deep political crisis. It’s a dangerous state of affairs, especially if the parliamentary conflict spills into the streets and communities. It could also lead to a major economic collapse which would, as always, hit the poorest the hardest. President Maithri Sirisena has made a desperate bid to stay in power – by joining forces with the butcher of the Tamils, Mahinda Rajapaksa. In the process, he has tried to throw his previous ‘partner’ Ranil Wickremesinghe under a bus. Then came the obscene spectacle of MPs being offered – and accepting – ministerial positions in return for changing sides. Some of them later changed back again when it looked like they had made the wrong choice – a corrupt version of musical chairs! Now there is political stalemate. The speaker of the parliament, Karu Jayasuriya, has ruled Sirisena’s move out of order, and no-confidence motions were passed on 14 November against the Sirisena/Rajapaksa coup. But they do not recognise that decision. Now their respective parties have called their supporters out onto the streets. But for what purpose? None of the establishment political parties have an alternative – and that includes the JVP and Tamil National Alliance. The TNA, although formally in opposition in parliament, has actually backed all the main pieces of legislation – and has only put forward the weakest of demands for Tamil rights. 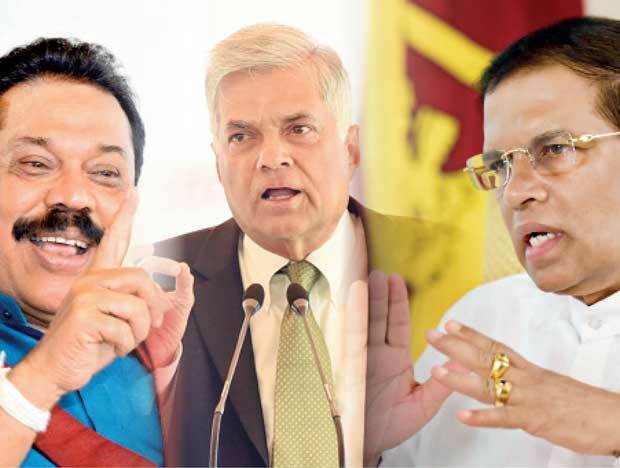 All of them backed the so-called ‘common candidate’ Sirisena against Rajapaksa in the January 2015 presidential election, and Wickremesinghe’s UNP struck a deal with Sirisena to become prime minister. On the promise of good governance, abolishing the executive presidency, bringing peace and economic growth – the so-called ‘100-day programme’ – Sirisena was voted in. Yet he had no intention of delivering on his promises. Not only that, the record of the Sirisena/Wickremesinghe administration is abysmal. The economy is on the ropes. Prices of basic food and goods are sky-high and rising. Corruption is at unprecedented levels. In the meantime, the so-called ‘international community’ has been fully engaged – each major world and regional power with a dog in the fight. There is a lot at stake. As soon as Sirisena had appointed Rajapaksa, representatives of the Chinese regime sent congratulations. As president, Rajapaksa signed numerous billions-of-rupees deals with China, including the Hambantota harbour complex in his own backyard, so it was bound to be pleased. Of course, Wickremesinghe then handed the harbour over to China on a 99-year lease – there are no matters of principle among these swindlers and cheats! Meanwhile, the IMF has suspended its Rs185bn loan facility. This is not because it cares about democracy. It’s because it wants to ensure that the conditions attached to the loans – privatisation of public services and utilities, cut-backs in social, health and education spending, etc – can be guaranteed. Clearly, it can’t be during such a political crisis. On 30 October, the EU ambassador warned that the EU ‘may consider’ withdrawing the trade concessions included in the General System of Preferences Plus – for the same basic reasons as the IMF. Similar noises came from the representatives of Indian, US and Japanese big business and government. They are keen to back anyone who might be able to act as a counter-weight to China in South and Southeast Asia. There is also another, just as cynical, reason for their interference. Sri Lanka’s political catastrophe has shocked people around the world. In order to try to maintain the hypocritical claim that they uphold human rights, western and regional powers will take to the international stage to denounce coups and wars, etc. But it’s a show. These representatives are not in Sri Lanka to see democracy and justice. They are there, in high-level talks and putting pressure on to protect their own vested interests, which boil down to big-business contracts – arms sales, infrastructure projects, privatised telecoms and utilities, etc – and geopolitical manoeuvring. Just look at the way the reactionary Saudi regime is getting away with brutal murder – not just the Khashoggi case, but the mass death toll in Yemen – because it is a strategic ally of the western powers. That makes it all the more unforgiveable that, when TNA leader Sampanthan met the US ambassador, Alaina B Teplitz, it appears he made no attempt to link the struggle for Tamil rights with the current crisis. It was reported that he merely said that the TNA stands for an ‘undivided, indivisible’ Sri Lanka, and that should be the framework for a resolution to the ‘Tamil question’. Sampanthan asked Teplitz to ‘maintain a constructive engagement’ with the government of Sri Lanka (what government?!) with regard to its commitment (what commitment?!) to the ‘international community’ and the United Nations Human Rights Council. As we are only too well aware, for nearly a decade the UNHRC’s occasional criticism of the government of Sri Lanka has produced nothing for the Tamils. Although there have been many crises over the years, the scale of the current crisis has shown just how rotten Sri Lanka’s political establishment is. Sirisena, Rajapaksa and Wickremesinghe – and their hangers on – have taken it to a whole new level. Today’s situation is extremely dangerous. Communal violence is poised to break out. With the establishment parties calling their supporters onto the streets, clashes could easily escalate and spin out of control. Black July 1983 is the nightmare scenario which could be revisited. Only this time, any and every community, ethnic or religious group could be targeted – while the prospect of conflict within communities could add a new terrible dimension. Already, on 29 October, soon after Rajapaksa was appointed prime minister, Mahson Balakaya leader, Amith Weerasinghe, and nine others accused of violence against Tamil Muslims in Digana were released on bail. Their supporters immediately took to the streets of the town in celebration. Undoubtedly, these thugs have been emboldened and the threat levels have increased once again. If Sirisena/Rajapaksa continue to hold onto office, they could even declare a state of emergency, giving them full powers over the state machine. With Gotabaya and his cronies in control of much of the security and armed forces, brutal violence and human rights abuses could occur anywhere in Sri Lanka. It is not hard to imagine lockdown in the North and East, and a return to disappearances. But the repression would also rain down on the heads of Sinhalese people who oppose the new regime. That could see a return to the white van kidnapping of journalists, the rounding up of workers’ strike leaders and activists, and another round of attacks on protesting students. What this political crisis shows, above all, is that none of the political parties in parliament represents the interests of working-class, poor and oppressed people in Sri Lanka. All of them are out for their own short-term gain. Of the establishment political parties and leaders, who has tried to mobilise mass resistance to the land-grab and military occupation in the North and East, and linked that to the need to fight for the right to self-determination for the Tamil-speaking people? Who has defended Tamil Muslims from attacks by right-wing Sinhala nationalist gangs? Who stands in solidarity with Upcountry people still fighting against 19th century line housing – in the 21st century – and poverty pay? Who stands with the public-sector workers campaigning against the neoliberal privatisation programme and for the payment of wages and pensions frozen by the crisis imposed by power-hungry politicians? Who backs the students taking action against education commercialisation? The answer, of course, is that none of them do. In fact, all of those policies, all of those attacks, and all of that oppression has been backed – or been allowed to continue – by every party in parliament. To varying degrees, all component parts of the political establishment are implicated in the current crisis – either by active involvement or through a complete failure to offer a real alternative. There is an urgent need to break this deadlock. There can be no trust in the political establishment. The workers, oppressed and exploited of Sri Lanka have nothing to gain from communal violence and division. A way needs to be found to link up the struggles. To organise community self-defence. Workers organised at factory and office level to make sure there are no sectarian divisions in workplaces. Teachers and students uniting to ensure the same on college campuses and in classrooms. Developing understanding that the maximum national, ethnic, religious and secular freedoms are actually the best way to unite people – fighting for the common interests of good housing, education, well-paid work, safe communities. Standing for the rights of workers and all oppressed people, including the right to Tamil self-determination. The political system is rotten to the core – as are the establishment parties. That will only change when a new political movement is built in the interests of all the workers, oppressed and exploited in Sri Lanka.